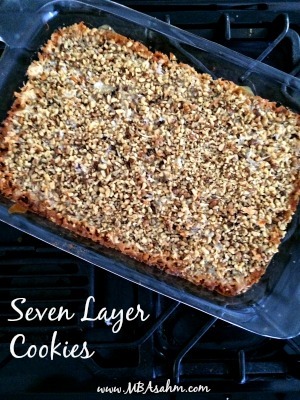 Seven layer cookies are possibly my favorite cookies of all-time. They are surprisingly easy to make, but your guests will think you are Julia Child when they eat these. It’s a pretty fool-proof recipe, so odds are you can’t mess this one up. In a 13×9 baking dish , pour the melted butter and make sure it is spread throughout the pan. Spread the graham cracker crumbs evenly over the butter and pat down to form a crust. Sprinkle the chocolate chips evenly. Sprinkle the butterscotch chips evenly. Sprinkle the shredded coconut evenly. Drizzle the condensed milk over everything evenly. Top with your chopped walnuts. For best results, you should make these 1 day ahead of time so they have enough time to cool. 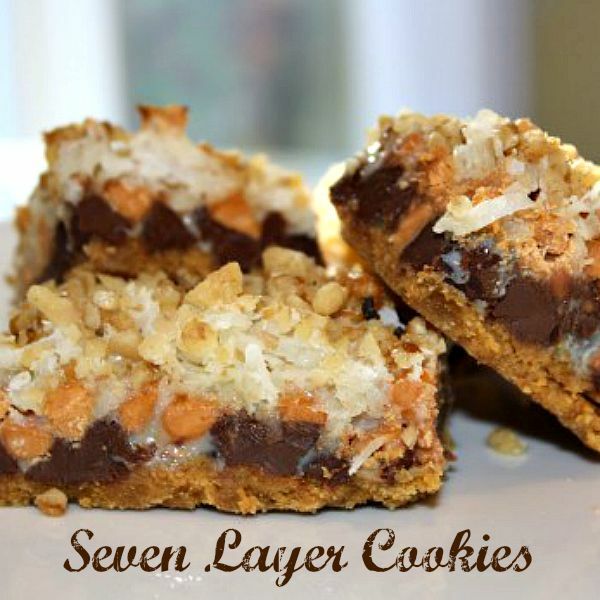 One of the greatest things about seven layer cookies is that they do not really get stale, so they will last a really long time. I was thinking of making these in silicone cupcake liners for cute presentation. Do you know how many this recipe would make so I divide evenly? That is such a great idea!! There is enough to fill a 13×9 pan, but it really depends how small you cut the squares, so I don’t know how you would divide it! However, other than the butter and graham cracker crumbs, everything else doesn’t need to be exactly precise. So I would just mix the butter and graham cracker crumbs together first in a bowl and then you could just put a little of each layer in the cups. Good luck! These were a staple in our Christmas baking every year growing up. One whole cup of butter is WAY too much! All the recipes I’ve seen call for 1/2 cup. You might want to check your measurements. Happy Holidays!! Yay!!! That is awesome!! 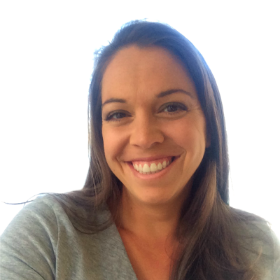 You definitely need to publish a post if you figure out a good gluten free alternative. And these are sooooo easy! Tell your kids they took you hours though 😉 Just for some extra points. Definitely going to be following your posts closely to get better at baking over the holidays 🙂 (and forever) Also, how do you create those eye-catching images? ooooooooooo those look good. I love butterscotch…I might just have to try those! these look awesome. We always made and called them magic bars, only we didn’t add butterscotch chips. So trying them with those. Sharing! OMG these look amazing! I’m going to have to try these out soon – I know my whole family would love them. Yum Yum! will make it some day at home! Thanks for the recipe.. They look delish! I have to try this recipe. Thanks for sharing! I may have to try this treat for our Thanksgiving Dessert. Pinning this! Thanks for sharing! Those look so indulgent! I’d have to make a smaller batch because I’d probably eat the large batch in the same amount of time! YIKES! I’ve had these before, I’m pretty sure, but I couldn’t ever remember what was in them to replicate them. So pleased that you shared the recipe. These are definitely going on my Pinterest board of sinful delights. So glad you’re going to try them! They are definitely sinful delights…but worth every bite 🙂 I hope you enjoy. Nikki, these cookies look amazing! I love every ingredient. Have you ever frozen them for future use? This is something I would love to make ahead for the holidays. BTW, if you haven’t already, please stop by Ducks ‘n a Row and share this recipe (and anything else you would like to) on my Wonderful Wednesday Blog Hop. It is published on 14 blogs so you’ll get lots of opportunity. My readers will love it. I found this post by visiting the Frugal Friday Link Up Party. I had to check this post out. I love cookies. I wonder if you cold leave out the coconut? Other than that, these look delish! You certainly could try! I’ve actually heard of a few people that didn’t like the idea of the coconut in it, so I’ll have to experiment to try and come up with a non-coconut version. But I will say, the coconut is not too overpowering, so maybe you’d end up liking it! G’day from Oz! Thanks for sharing your recipe at the Say G’day Saturday Linky Party. I’ve just shared this on Pinterest/Facebook/Twitter. Hope you can link up with us again this Saturday! YUM!! And that’s all I have to say about that 🙂 Ha. Sounds really good.